I’d only been in the area for six months, but everywhere I went in the small college town, people were welcoming and open. Everyone waves when you pass them on the street. But something was still missing as I attempted to settle in to my new life here, and I thought a dog couldn’t hurt. Give me someone to talk to. And I had just seen Reggie’s advertisement on the local news. We struggled for two weeks (which is how long the shelter told me to give him to adjust to his new home). Maybe it was the fact that I was trying to adjust, too. Maybe we were too much alike. Well, I can’t say that I’m happy you’re reading this, a letter I told the shelter could only be opened by Reggie’s new owner. I’m not even happy writing it. He knew something was different. So let me tell you about my Lab in the hopes that it will help you bond with him and he with you. First, he loves tennis balls. The more the merrier. Sometimes I think he’s part squirrel, the way he hoards them. 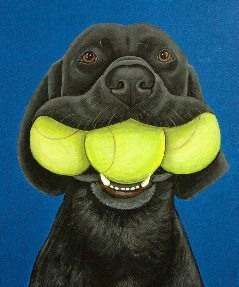 He usually always has two in his mouth, and he tries to get a third in there.Hasn’t done it yet. Doesn’t matter where you throw them, he’ll bound after them, so be careful. Don’t do it by any roads. Next, commands. Reggie knows the obvious ones – “sit,” “stay,” “come,” “heel.” He knows hand signals, too. He knows “ball” and “food” and “bone” and “treat” like nobody’s business. And that’s why I need to share one more bit of info with you… His name’s not Reggie. He’s a smart dog, he’ll get used to it and will respond to it, of that I have no doubt. But I just couldn’t bear to give them his real name. But if someone is reading this … well it means that his new owner should know his real name. His real name is “Tank.” Because, that is what I drive. I told the shelter that they couldn’t make “Reggie” available for adoption until they received word from my company commander. You see, my parents are gone, I have no siblings, no one I could’ve left Tank with … and it was my only real request of the Army upon my deployment to Iraq, that they make one phone call to the shelter … in the “event” … to tell them that Tank could be put up for adoption. Luckily, my CO is a dog-guy, too, and he knew where my platoon was headed. He said he’d do it personally. And if you’re reading this, then he made good on his word. Tank has been my family for the last six years, almost as long as the Army has been my family. And now I hope and pray that you make him part of your family, too, and that he will adjust and come to love you the same way he loved me.